Patio – What can it add to your home? 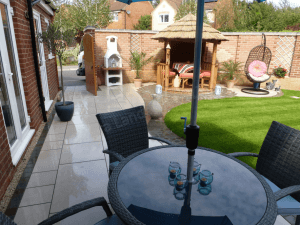 Patio areas are becoming increasingly popular for different kinds of people; those who are time poor and are in need a low maintenance garden, those who wish to spend more time outdoors, and those who seek to add tons of property to their properties. So, what exactly can a patio add to a property? Many homeowners feel patio areas can add additional dining and entertaining space, and they aren’t wrong…patios are today being seen as ‘extended living rooms’. And if you thought patio areas are only to be enjoyed in the summer, you’re wrong! The winter is the perfect time to sit out in the garden with a book and nice glass of wine, accompanied by a roaring fire pit, candles and a blanket. A low maintenance option for time-poor homeowners. Patios prove to be extremely useful for homeowners who don’t have the option of maintaining their garden all the time. There’s no need to mow, water or do anything to your patio (except from the odd brush now and then!). We suggest looking at sites like www.marshalls.co.uk, as they produce quality products that are built to stand the test of time. Look at Marshalls Stone Standard to find out what characteristics make a quality stone.